Location: Mobile but I found that at the New West Street festival on Front St.
Prices were as follows: Most sandwiches were $12, waffle fries alone is $7, pull pork waffle fries is $14. Based on the prices, I didn't really want to break the bank so I went with the pull pork waffle fries. 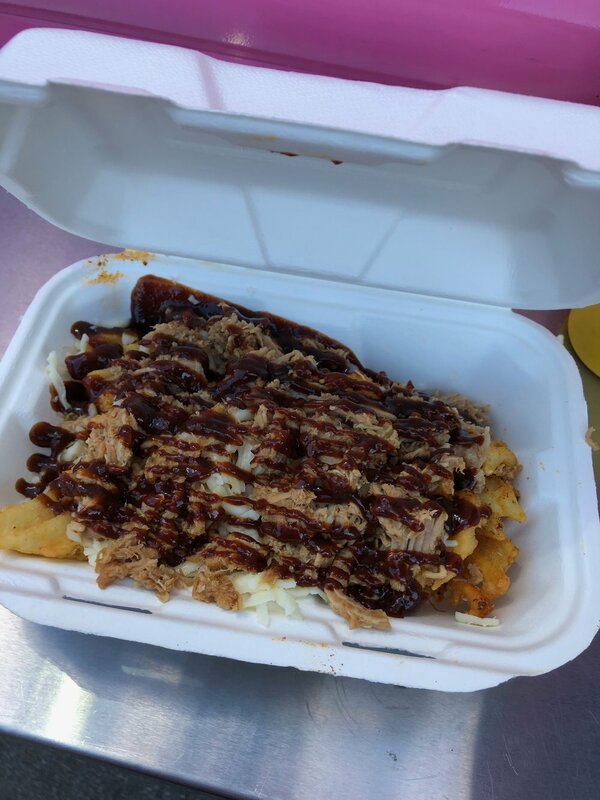 First layer, waffle fries, second layer, cheese, third layer, pulled pork, fourth layer, bbq sauce. Overall it was good, was it $14 good? Hell no. There wasn't a lot of options there so this was the best choice. Pulled pork was in a tray on the stove and was placed into buns as they were ordered. If you go to this street festival, you can actually go to the New West Concession stand on the other side of the tracks, better yet, go to the Quay and get yourself some fried chicken.